There is no denying that the iPhones are great, and Apple has done a great job designing the phone. I am not just talking about the hardware, but the way the hardware works with the software is just too good. However, one thing that iPhone lacks behind is a good software which allows you to manage the phone without any issues whatsoever. I know that iTunes is still what Apple suggests, but I am not ashamed to admit the fact that Apple is lagging behind when it comes to the iTunes. This, and the fact that there are so many iTunes alternatives available in the market, people are finally realizing that they can get a better option. 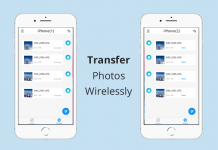 If you want the best iPhone Transfer Software, I would whole heartedly endorse iMobie AnyTrans; I have reviewed the software before, and absolutely loved it, but the good news is that they just introduced a new update that has made the software even better. They are calling it their biggest update. So, in this AnyTrans review, we are going to be revisiting the software, and not only that, we are also going to check out all the new features that were introduced with the update to ensure that there is nothing left behind. So, let’s not waste any time and have a look at the review. Since I have already reviewed the software before, and had a look at all the features. I am going to do something different. Instead of focusing on the older features. We are first going to take a look at the newer features, so that people are properly informed about the decision they want to make. As I have stated before, the update happens to be the biggest update they have released, and along with this update, they released a handful of amazing features. So, with that in mind, we are going to be looking at the features to have a better understanding. For anyone who has used an iPhone it is safe to assume that you are aware of the restrictions the OS puts on its users. Even changing a ringtone can be a huge hassle. However, the good news is that with AnyTrans’ new update, you can actually manage your ringtones with great ease. With the new update, the software allows you to have several media resources that you can choose from. You can choose from the YouTube videos, the music you have on your phone, or the videos that you have on your phone; trim the favourite part, and you can actually save the created ringtone in your Ringtone Library on your iPhone. There is no denying that the App Store is a great place for finding some of the best apps there are. 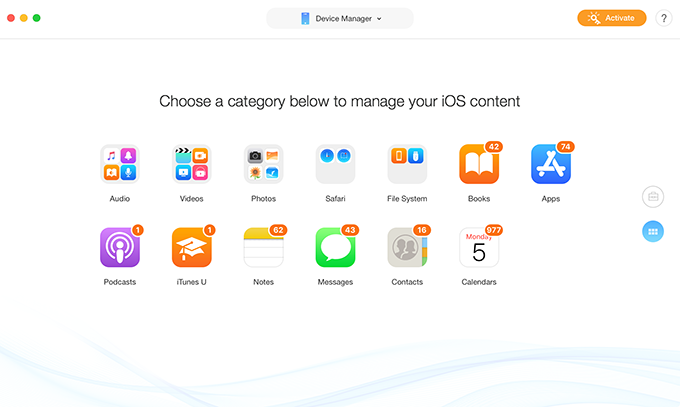 However, you need to understand here is that managing apps on your iPhone can be a pain especially when you do not know much about the restrictions that are applied. The good news that comes with the new AnyTrans update is that thanks to this update, you can actually go ahead and download pretty much any app you want from the official App Store. That is not all, you can even store copies from the apps you download on your computer. The new update also allows you to update, downgrade, as well as install and uninstall any app without any issues. The best part is that AnyTrans employs the App Store Search API; so you can be content that whatever app you are downloading through AnyTrans will be hundred percent safe, and there will be no discrepancy. I love this feature because it has made managing apps so much easier. I no longer have to worry about scrolling to find the apps that I want to keep and the ones I do not. I absolutely detest cluttered and unorganized home screens, and I am pretty vocal about that too. Previously, arranging the home screen and organizing it properly was not an option on an iPhone. However, with the new AnyTrans update, you can easily arrange your home screen by simply dragging and dropping. 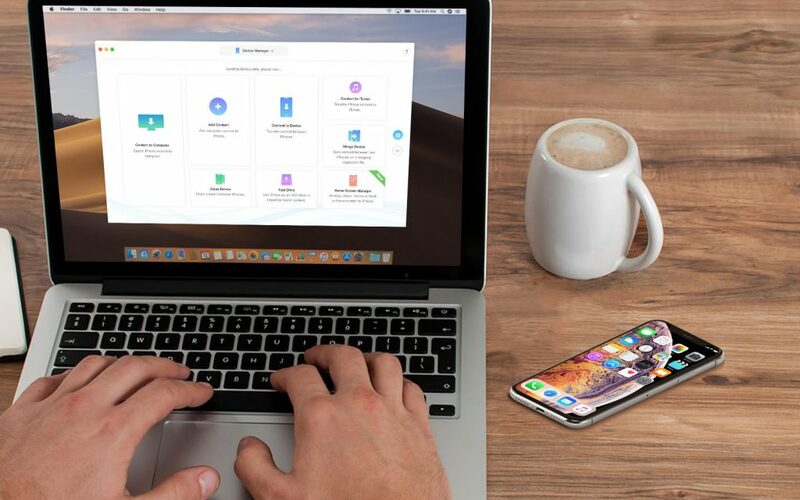 You can even use a simple one-click method that will sort all your apps into folders, by categories, and by colours should you wish to go for that next level cohesion between all the apps you have. Not just that, the feature also lets you clean the damaged icons from your screens without any issue whatsoever. These features are notable, because a lot of fans have been requesting them for a long time now, and having the features on AnyTrans just makes the software so much better. For a detailed overview of all the features that are new, click here and have a look. If you are worried that the new update may have changed the way you will be using the software then don’t worry. Even after the update, AnyTrans remains one of the easiest to use transfer softwares I have used until this day. 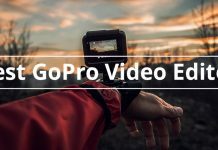 If you are still wondering about how you can use this software, I am going to talk about some of the basic how to of this software. This will surely give you a proper idea as to how you are going to use this software. Step 1: The first step is to download and install the AnyTrans software. Step 2: Once the software is downloaded, simply go ahead and launch it. 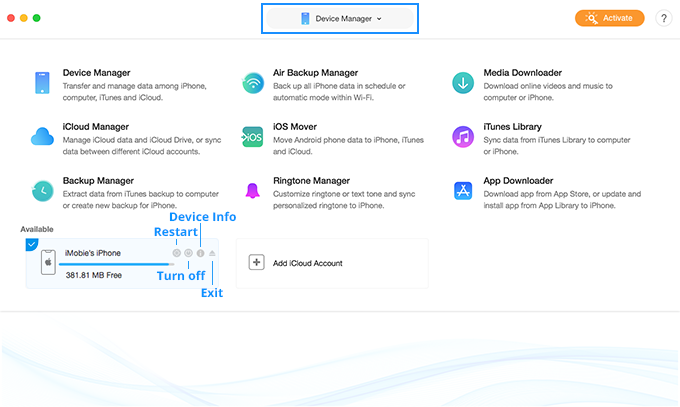 Step 3: Once you have launched AnyTrans; simply go ahead and connect your iOS or Android device. You will be taken to the main interface which will look like the screenshot below. Step 4: If you want to transfer your iOS data by category, simply click on the blue button with 6 squares on it. 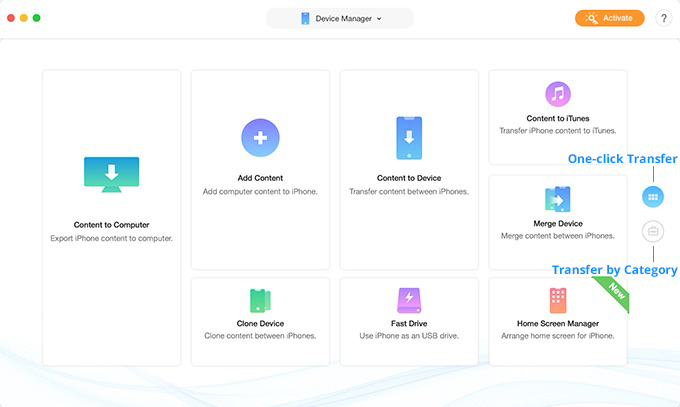 Step 5: If you want to explore more features of the AnyTrans that include the newer and the older features, simply click the arrow that is next to “Device Manager”, and a drop down menu will appear, showing you all the new features, as well as the old ones. Step 6: Simply click on whatever feature you want to use and you will be taken to the respective screen of the feature that you have selected. I love how the developers have made the software such a joy to use. As someone who has used the AnyTrans software before, I can say that I was already in love with the software. Ever since I first reviewed it; the software has been my go to for transferring files over to my phones. However, there were some features that were missing, and the good news is that the developers were very open and accepting towards that as well. With that out of the way, the latest update changes everything. AnyTrans has become the best transfer, and iPhone manager the market has to offer. My recent experience was nothing sort of amazing. Not only the new features are amazing, but also the older features that I loved so much are still as consistent as you could think of. Overall, I would say that AnyTrans has turned into the software I always wanted but did not know that I need it. I am glad I got the chance to test out the update as it is everything you could want from an iPhone manager, and more. Already the excellent set of features made even better. Supports both iPhones and Android. 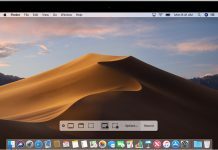 Can run on both Windows and Macs. The perfect phone companion one could ask for.